The $1.76 billion Gold Coast University Hospital is the largest public health infrastructure project currently underway in Australia. ARC’s experienced team of engineers, schedulers and bar processors developed an award-winning ‘Transi-Barrier’ swinglift unloading system to prevent falls from height during the entire delivery process of reinforcing steel. The new $1.76 billion, 750-bed tertiary Gold Coast University Hospital is part of a major expansion of health services for the Gold Coast community. The site covers an area of almost 20 hectares and will replace the existing Gold Coast Hospital, which was built in the 1970s. trauma response (including a helicopter retrieval service and rooftop helipad). ARC has supplied more than 7,500 tonnes of steel to the project, mostly in the form of processed bar, as well as mesh and $500,000 of building accessories. ARC resourced the development with a project manager, a delivery coordinator and two onsite schedulers. A number of environmentally sustainable practices have been incorporated into the design of the hospital, including heat recovery units, water harvesting tanks, energy efficient lighting, waste minimisation, and the use of recycled materials. 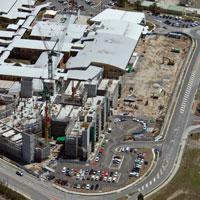 The hospital forms part of the new Gold Coast Health and Knowledge Precinct planned for the area. The Precinct will include retail shops, light rail, more bus stops and easy access to the Hospital and Griffith University. One of the biggest safety initiative challenges of supplying reinforcing steel to the Gold Coast University Hospital was working at heights when steel arrives on delivery trucks. ARC overcame this challenge by developing a custom swinglift unloading system which removed the risk of working at heights. “ARC engineers developed the ‘Transi-Barrier’ system, eliminating the risk of falls from height during the entire delivery process of steel reinforcing. The system is a 40-foot container base with side barriers that can be lifted on and off the delivery truck using a conventional semi-trailer mounted side loading crane,” says Murray Riemann, ARC Queensland manager—Contract Bar.